February is the time of the year when we always come up with something new and exciting. It is the time to bring the change and offer something special to the whole community. We have a special announcement for the whole online community this month. 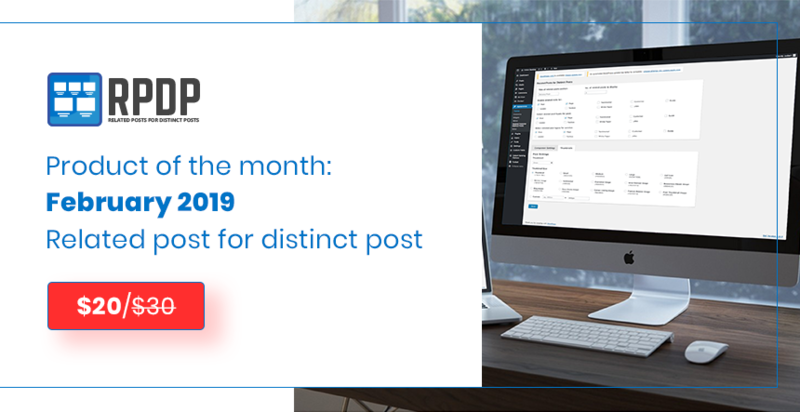 We are excited to announce one of our most liked plugin ‘Related Post for Distinct Post’ as our product of the month for February 2019. You will get the plugin at a 33% reduced price throughout the month with this announcement. It is a wonderful solution to display related posts together anywhere on the website. Ever wondered about how can you showcase the relevant content on the website based on user interest to keep them hooked? It’s always a problem for every webmaster. Related posts for distinct posts plugin solves your problem of showing the related content on the website together. It helps you with offering the content that users are interested in. You don’t need to select the related posts manually every time when you publish a new page or posts. It can be easily done by a few clicks only. Related Posts for Distinct Posts lets you display the list of different default posts as well as custom post as related posts for your WordPress website. You can search and select different related posts for every single individual post. You can also set up certain rules to select the related posts. Offering related content to the users is a matter of few clicks only. Support various post meta like comments, authors, excerpt etc. Related post for distinct post is nominated as a product of the month for February 2019. We are offering the plugin at the special 33% reduced price over this month. You can buy the Related Post for Distinct Post at just $20 throughout this month. Grab the deal now to explore more features of the plugin. grab the deal of the February 2019. It’s not all over yet. Related Posts for the Distinct Post is the product of the month for February 2019. We will bring one of our products every month to get the benefit of the offer. Stay tuned to know more about the Product of the month updates and don’t miss to grab the deal.